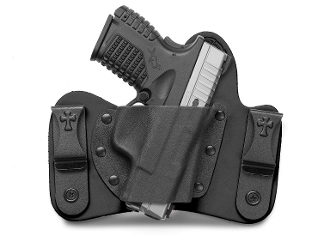 The revolutionary CrossBreed® SuperTuck® is the most comfortable and concealable inside the waistband (IWB) holster you'll ever wear. Designed exclusively and patented by CrossBreed® Holsters, the flagship SuperTuck Deluxe® is hand molded to fit each specific firearm listed. It features a premium leather backing with a molded and mounted kydex pocket. Versatile for carry options, the SuperTuck may be worn comfortably with or without your shirt tucked in - based on your personal carry style. The SuperTuck is designed to be carried towards the rear of your draw side - 3:30 to 5 o'clock for right hand draw or 7 to 8:30 for left hand draw. The SnapLok powder coated steel belt clips are modular, enabling you to adjust cant AND ride height. Three different leather choices, optional combat cut and additional clip choices allow each individual to choose the combination of options that they prefer for their personalized, handcrafted holster. Copyright © 2014-2019 Keep Calm & Carry. All rights reserved.